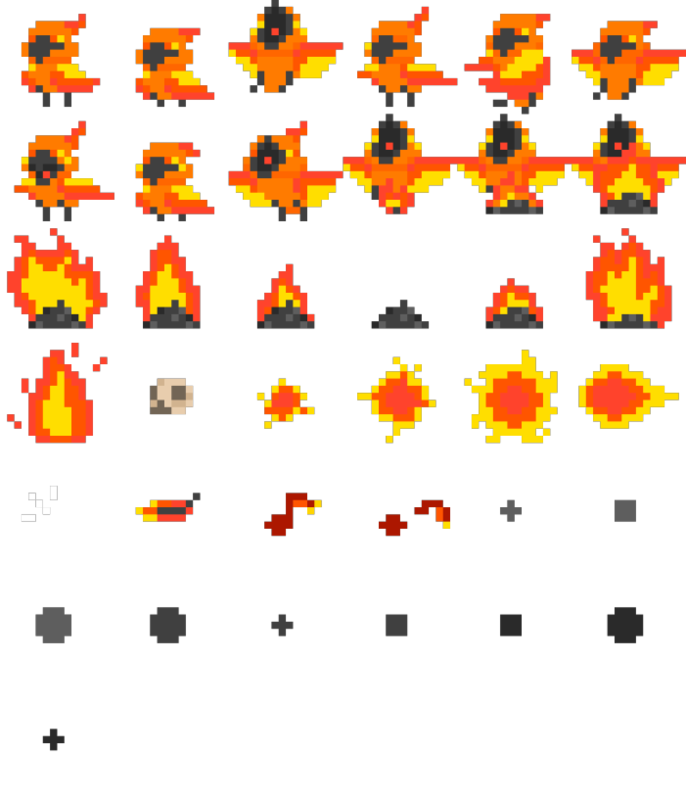 Hey guys, here’s the last 2 enemies from the EBF5 foe competition! The competition is now over, and I’ll do a little post to feature the runner-ups later. Anyway, here’s Mermaid by Lester Vine, and Totom by Jay again. 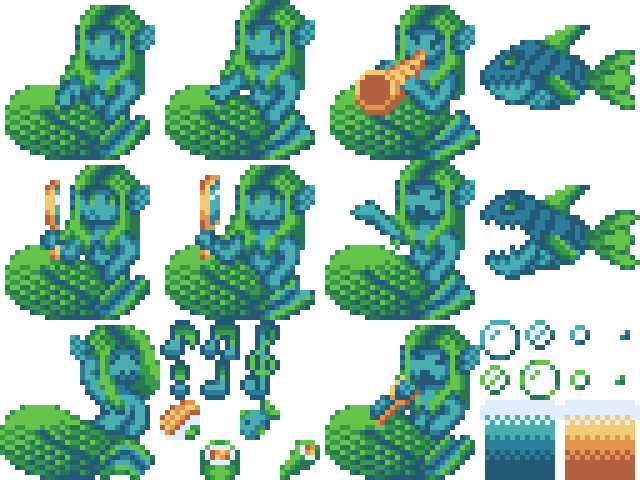 Please throw some suggestions for a name for the mermaid, as she’ll likely have a few lines to speak. Here’s a list of possible names. I’m leaning towards Coralia or Melody. This entry was posted in Epic Battle Fantasy 5 on April 18, 2019 by Matt Roszak. 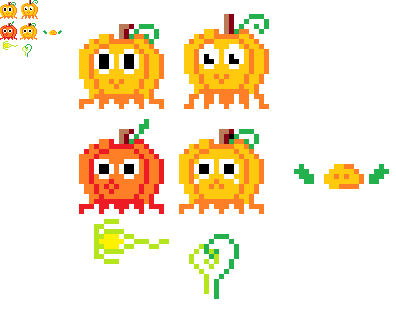 Hey, here’s 2 more fan-designed enemies. 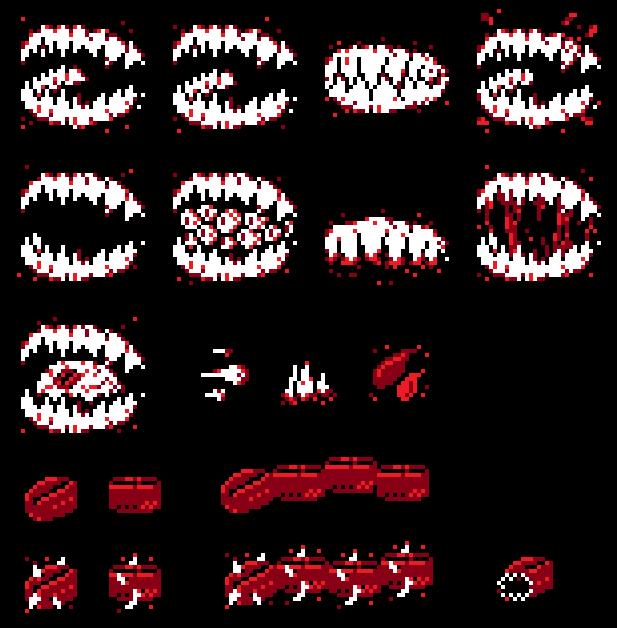 These two are probably going to be the strongest of the pixel foe bunch, possibly even being boss-tier. 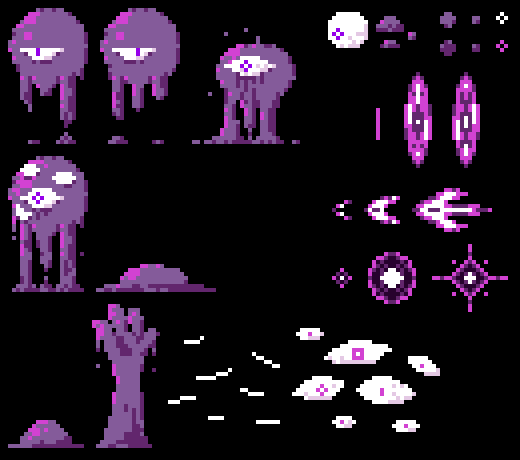 I’m thinking of doing 4 more enemies from the competition, so there’s still a few days left to enter. Guoye is by Jay, and The Maw is by Mico. Additionally, the sword that Guoye summons is by Bolt Zyphyr. 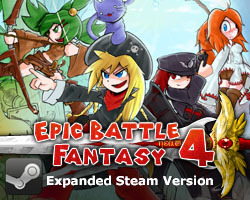 The EBF5 update is likely to add 25 new foes, and also bring back a bunch from earlier games. So that’s a lot of new enemies. (plus other stuff to be shown later). This entry was posted in Epic Battle Fantasy 5 on March 29, 2019 by Matt Roszak. 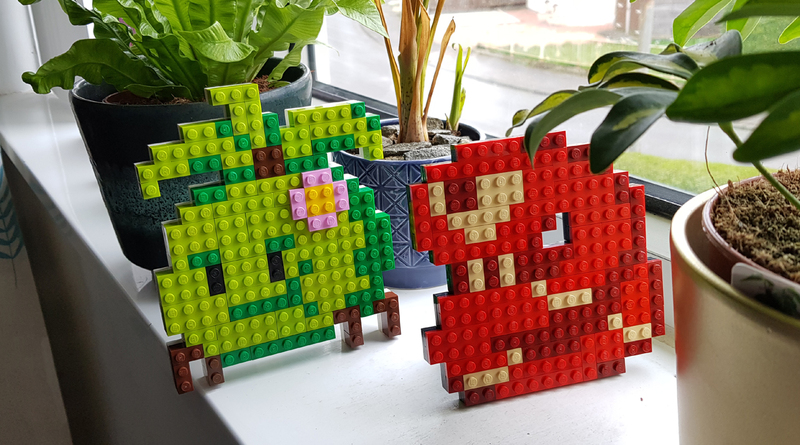 Hey guys, here’s the first two winners of the EBF5 Foe Competition! The competition isn’t over yet, but there’s not much time left, as I’m gradually considering winners. 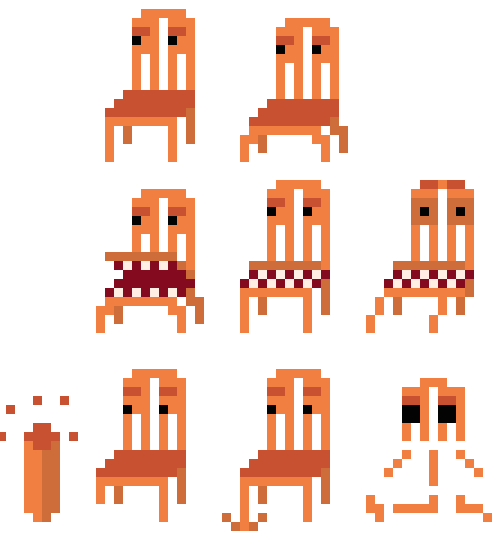 Angry chair is by Dumfro, and Treagure is by ScepterDPinoy. I’ve made a few changes, mainly to make them appear better against a black background. This entry was posted in Epic Battle Fantasy 5 on March 27, 2019 by Matt Roszak. Hey guys, I’m not working this month, but I still want to do something for my patrons, so I’m sharing the entire EBF5 source code with them. It’s just for the purposes of personal education, and datamining (for walkthroughs etc). The code is quite messy in many places, and the comments aren’t always accurate or useful. Timeline code from the animations is not included, so some important stuff is missing, and none of the code will compile unless you edit it to stand alone. You’re best opening the files in FlashDevelop, but any code editor should do okay. Some files are easy to read without any programming knowledge, like the lists of item stats. While other files will require you to be familiar with Actionscript, Java, or similar languages. So if you want to see what “real” code looks like, as opposed to ideal textbook code, toss me $1 to get it. This entry was posted in Epic Battle Fantasy 5 on March 18, 2019 by Matt Roszak. Hey guys, here’s a long blog about game-dev related stress. 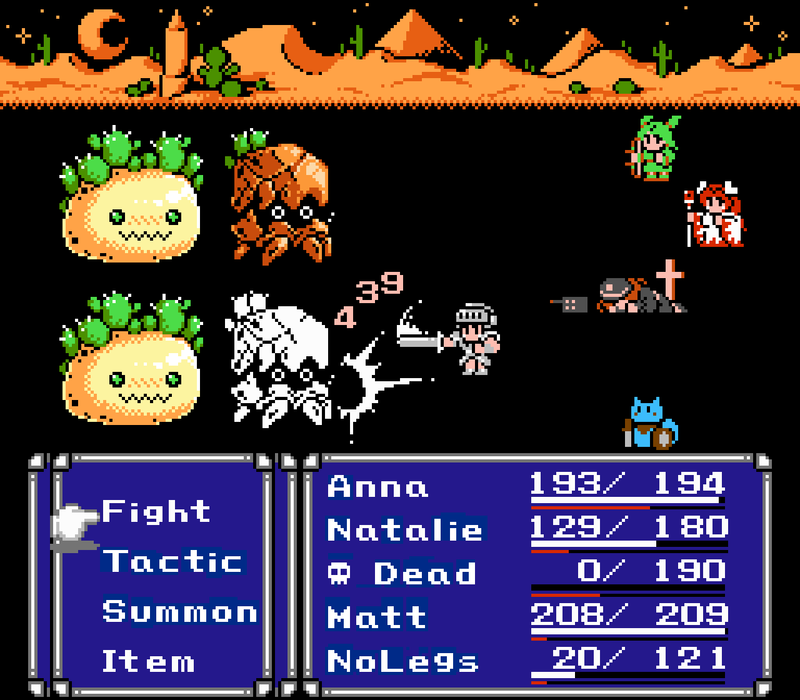 Since around November when Epic Battle Fantasy 5 was approaching completion, I’ve been incredibly stressed about it. It’s actually likely I was stressed long before that, but just worked through it and didn’t notice too much until then. The worst has passed, but even now, 3 months after a very successful launch, the game is still causing me a lot of anxiety. I’ve never felt this way about other games that I’ve made. It’s hard to write about because it sounds weird to say it – nothing even went wrong! – but I’ll try to organise my thoughts and figure out why I feel this way. EBF5 was by far my largest project, taking up 3 years of full time work, without any major breaks. My previous largest project was EBF4, which maybe took around 1.5 years, but I worked on it on-and-off. It’s definitely not healthy to work on a single project for so long. I’m financially secure (largely from EBF4 doing very well for many years), so I didn’t need any funding to make EBF5, and if it flopped completely I’d still be fine financially. However, it would have still been a major bummer to spend 3 years making a game that no one was interested in playing. I was fairly confident that EBF5 would be a success – just based on the huge number of people that were following its development – but there’s always that nagging feeling that something might go completely wrong before I finish it. 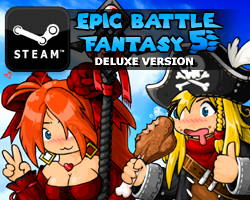 EBF5 was the first game I’ve made specifically for Steam, with the browser version being more of an afterthought. That put a lot of pressure on me to make sure it’s a game worth paying for, and so that no one can say “well, the previous games were free, why do I have to pay for this one?” I know people don’t take kindly to sequels that don’t have at least as much content as the previous game, so I had to make sure the new game was bigger AND better by just about every metric possible, while also trying out some new ideas. It’s hard to please everyone, but I think it’s worth trying. Keeping old fans is way easier than finding new ones. I like to batch my work and complete each part before moving onto the next. For example, I spent around a month just drawing trees and rocks and other background stuff. Debugging took almost 2 whole months. I did most of the art assets before any coding, so the game was half finished before I even had a playable prototype done! This approach worked efficiently in my previous games, but this time I just ended up doing the same kind of work for too long at a time, and it became really monotonous and demotivating. Maybe I should have taken turns working on different parts of the game, or maybe that would have made development take even longer. It’s definitely going to be a while before I commit to spending more than a year on a project again. A lot of people may say “just don’t work so hard!”, but I’d never get the game finished if I didn’t! Progressing slowly is even more demotivating than being overworked! The weeks leading up to the launch were the worst. I set myself a deadline because I didn’t want to go over 3 years of development time, wanted to launch before a bunch of major AAA games, and I was getting seriously diminishing returns from debugging and polishing by that point. I had 2 weeks to fix a few major bugs that turned out to be more complicated than I thought. Deadlines are no fun, but continuing to work on the game instead of launching may have been even more soul-crushing. Things got really emotional, and my whole life revolved around finishing the game. I just had to get it done, even if it wasn’t perfect. My girlfriend Ronja was a lot of help around launch time. She helped me test the game, and did a lot of customer support, while I was stressing out with debugging. I’ve now hired her to keep doing that, and also to do some social media posts for me. However, it turns out it’s not so easy to hire someone! I had to waste a few days learning about all the relevant laws, and doing tax paperwork. In the long term it’ll reduce my workload and be worth it, but it was a painful transition! I can totally see why many people are opposed to government regulation, or may even illegally dodge taxes. It’s just such a thankless and tedious task to do this stuff correctly! I always liked to think of game development as a hobby, even when I started making money from it. I’m just some guy working at a computer, from his home, whenever he feels like it. I only have to do the bare minimum paperwork to keep the tax man happy. That approach isn’t really working for me anymore – I’ve got an employee now, my tax situation is getting more complicated, and I’m generally not prepared on the business side of things. I’m starting to feel the weight of new responsibilities that I never wanted. Being your girlfriend’s boss is also a weird dynamic to explore. There will be some growing pains, but I’ll do some studying, hire an accountant, and get over it eventually. What a first-world problem – I’m too successful! Another issue I’ve been having lately is that I’m spending more and more time dealing with people. There’s many volunteers helping me out, either with moderating the EBF Discord server, writing wikis, helping with translations, or sending in fanart. I’m incredibly thankful that people want to help out in all sorts of ways. However, sometimes this means that I have to sort out disputes and arguments, especially on Discord, and I often don’t know the best way to deal with them. I’m neither their boss nor their friend – I don’t really know what our relationship is – and that makes things quite awkward sometimes. I feel I’ve gotten worse at dealing with this as I’ve gotten older and more mature. In my late teens and early twenties, I wasn’t as sensitive to other people’s feelings as I am now. Especially on the internet, I would often reply bluntly to comments, or ignore many of them completely. I’ve always done my best to read all the comments I receive, but I never really thought of them as being made by real people. Everyone online was just an anonymous user. The internet is a bit more personal these days, so that’s harder to do. I’m still trying to figure out how to be nice to my fans without getting too close to them. Even now that EBF5 is launched and stable, every little update I need to do poses a risk of accidentally breaking something – maybe even deleting saved games! There’s a lot at stake, and I’m still terrified of making a major mistake, even though my fans have always been forgiving. I’ve done my best to mitigate all the risks, but there’s always a chance. So this might have been a bit of a bummer to read. Launching EBF5 brought me more stress than joy, even though it went incredibly well. I guess next time I’ll try to do things a bit differently, and I’m already starting with the EBF5 DLC – I’m only adding content that sounds like it will be fun to develop, and I’m not going to work so hard this time. I’m not sure what I’ll work on after that though. I don’t want to jump into another huge project, and the thought of working on another EBF sequel fills me with dread. But at the same time, my career success is solely down to this series, so obviously a lot of my self-esteem is tied to it too. 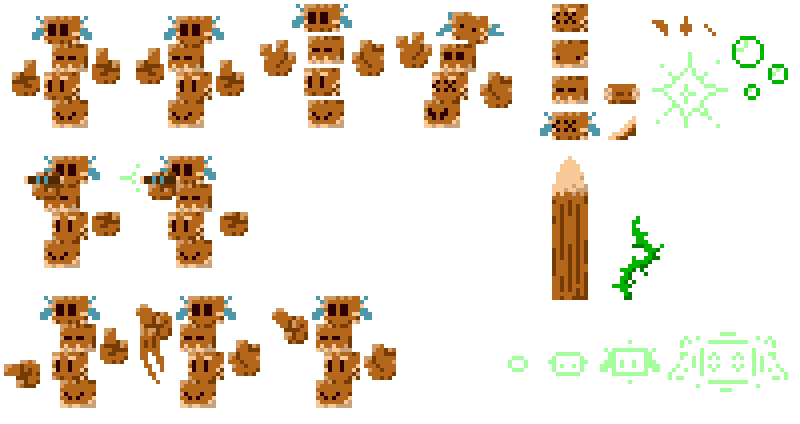 I think a lot of people would be let down if this was my final masterpiece, and personally I’m not sure if I’ll be satisfied with only making small games from now on. I guess there’s no winning either way. Achieving important things is not easy. I’m not depressed or anything – it’s specifically just EBF5 and all the baggage associated with the series that’s causing me stress. Hopefully I’ll be able to find some sort of balance between what I want to work on and what others want me to do. This entry was posted in Epic Battle Fantasy 5, Personal Life, Thoughts and Opinions on March 3, 2019 by Matt Roszak. I did an interview type thing! You can listen to me ramble about game dev stuff for an hour. This entry was posted in Epic Battle Fantasy 5, Thoughts and Opinions on February 24, 2019 by Matt Roszak. Here’s a little mockup for something that’s never going to be made. This entry was posted in Epic Battle Fantasy 5, Misc Art on February 23, 2019 by Matt Roszak.